Empowerment is more than giving people additional responsibility - to be empowered, people need to feel empowered. When people think of employee empowerment they tend to think of giving employees more responsibility and decision-making authority. To empower an employee, I give them more power - and this is true, but it’s only one dimension of employee empowerment. The critical piece of the puzzle that is often overlooked is the feeling of empowerment. 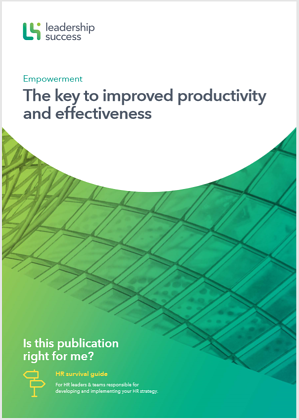 Numerous studies over the past two decades have found that the feeling of empowerment leads to increased employee productivity and effectiveness4,12 along with a host of other benefits, including higher job satisfaction1 and reduced turnover intentions8,4. One study even found that leaders who reported higher levels of empowerment were seen by their employees as more innovative and inspirational10! The really interesting thing about all of this, is that giving employees more authority and responsibility does not necessarily lead to feelings of empowerment. In some cases, it does just the opposite. Known as social-structural empowerment, this is generally what people are referring to when they talk about empowerment. It involves giving employees more responsibility, more control over their work, and more authority to make decisions. The general idea here is that by empowering the lower levels of the organisation to make decisions, it reduces red tape and bureaucracy and enables decisions to be made more quickly. It also frees up time for upper management to think about how to move the organisation forward rather than being bogged down with routine operational issues. Known as psychological empowerment, this refers to how an individual feels rather than the level of responsibility or autonomy they actually have. You must feel empowered to be empowered. And it's this feeling of empowerment that leads to all the good stuff. Meaning – Feeling that your work is important and meaningful. Competence – Feeling confident in your abilities to do your job well. Self-determination (autonomy) – Feeling that you have control over how you do your job. Impact – Feeling that you have an impact on what happens in your team/department. So, as you see, giving employees more power does not necessarily empower them. It does in the sense that they have more actual power, but it doesn’t guarantee they will feel empowered. In fact, large amounts of responsibility can be disempowering if employees lack the confidence to handle it13. It's important that your people are provided with adequate information about how their performance affects team and organisational performance (e.g. output, financial performance, customer feedback) so they understand the impact they have3. Be transparent with key organisational performance information (e.g. sales, costs, customer satisfaction, output, quality). Create a clear link between the organisational strategy and individual tasks. Employees need to see that their feedback and suggestions are taken seriously - that they have some influence over what goes on. A supportive, trusting relationship with one’s leader is an important factor in empowerment12. Leaders need to involve, coach, support and communicate openly with their employees12. Poor leader behaviour can negatively impact an employee’s feelings of meaning, competence, autonomy and impact. Leaders must involve employees when making decisions that affect them. Leaders must create an environment for employees to safely express their ideas and opinions. Leaders must help their employees solve problems and build their skills and expertise. Leaders must show genuine concern for their employees and treat them as equals. Leaders must be transparent in explaining rules, expectations, decisions and actions. The research is clear; feeling empowered drives better results. By focusing on good leadership practices and increasing organisational transparency, you can engender feelings of empowerment in your employees and reap the performance benefits. Get this super-helpful PDF to print, save or share with colleagues. Need help creating a leadership environment that encourages employee empowerment? Aryee, S. & Chen, Z.X. 2006. Leader-member exchange in a Chinese context: Antecedents, the mediating role of psychological empowerment and outcomes. Journal of Business Research, 59: 793-801. Avolio, B.J., Zhu, W., Koh, W., & Bhatia, P. 2004. Transformational leadership and organizational commitment: Mediating role of psychological empowerment and moderating role of structural distance. Journal of Organizational Behavior, 25: 951-968. Gibson, C., Porath, C.L., Benson, G., & Lawler III, E.E. (in press). What results when firms implement practices: The differential relationship between specific firm practices, firm financial performance, customer service, and quality. Journal of Applied Psychology. Koberg, C. S., Boss, W., Senjem, J. C., & Goodman, E. A. 1999. Antecedents and outcomes of empowerment: Empirical evidence from the health care industry. Group and Organization Management, 34(1): 71-91. Lawler, E.E. (1996). From the Ground Up: Six Principles for Building the New Logic Corporation. San Francisco: Jossey-Bass. Liden, R.C., Wayne, S.J., & Sparrow, R.T. (2000). An examination of the mediating role of psychological empowerment on the relations between the job, interpersonal relationships, and work outcomes. Journal of Applied Psychology, 85: 407-416. MacDuffie, J.P. 1995. Human resource bundles and manufacturing performance: Organizational logic and flexible production systems in the world auto industry. Industrial and Labor Relations Review, 48: 197-221. Sparrowe, R.T. 1994. Empowerment in the hospitality industry: An exploration of antecedents and outcomes. Hospitality Research Journal, 17(3): 51-73. Spreitzer, G.M. 1995. Psychological empowerment in the workplace: Dimensions, measurement, and validation. Academy of Management Journal, 38, 1442-1465. Spreitzer, G.M., De Janesz, S., and Quinn, R.E. (1999). Empowered to lead: The role of psychological empowerment in leadership. Journal of Organizational Behavior, 20: 511-526. Spreitzer, G.M., & Mishra, A.K. 1997. Giving up control without losing control: Trust and its substitutes’ effects on managers’ involving employees in decision making. Group and Organization Management, 24(2): 155-187. Spreitzer, G.M., Kizilos, M. A., & Nason, S.W. 1997. A dimensional analysis of the relationship between psychological empowerment and effectiveness, satisfaction and strain. Journal of Management, 23: 679-704.